Such a wonderful little company, located right here in the U.S.A.... Michigan, in fact. The name "Parvum Opus" means little works of art and all of this company's functional, yet beautiful, products are certainly that. 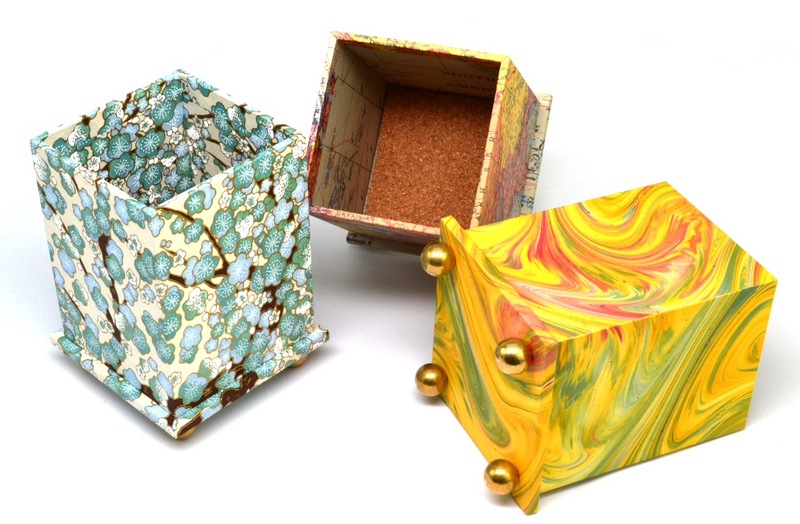 The owner, Erika Stefanutti, is a studio artist with a deep love of books, and of the craft and design tradition. 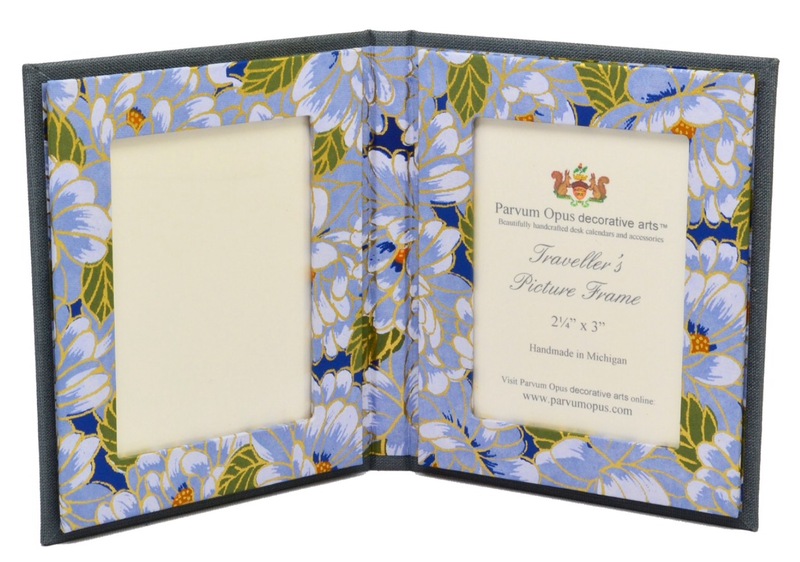 The really terrific thing about Parvum Opus is that you can choose the paper that you want your items to be made with. 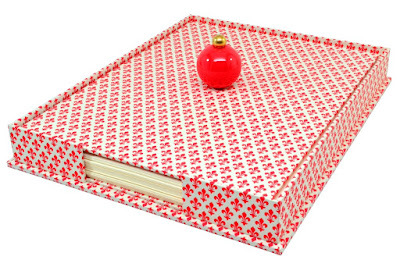 The In or Out Box above has a finial-adorned cover so prying eyes cannot gaze at your paperwork. We love this feature! Storage/file boxes come in several sizes and provide a decorative way to store old paperwork, photos or documents. 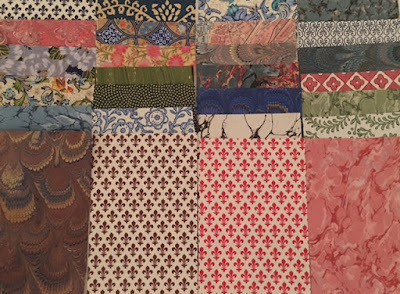 They look especially great stacked up.....all in one print or a combination of like-colored prints. 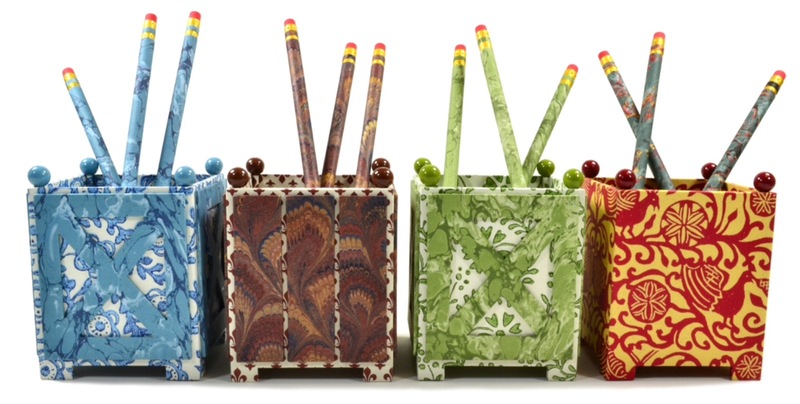 Don't you just adore the little brass feet on these pencil cups ? The interior is lined in cork to protect the bottom from pencil lead or leaking ink. Tiny notebooks can be ordered in a multitude of designs and are a favorite for party favors. Just an extra little present for your guests to let them know you care. 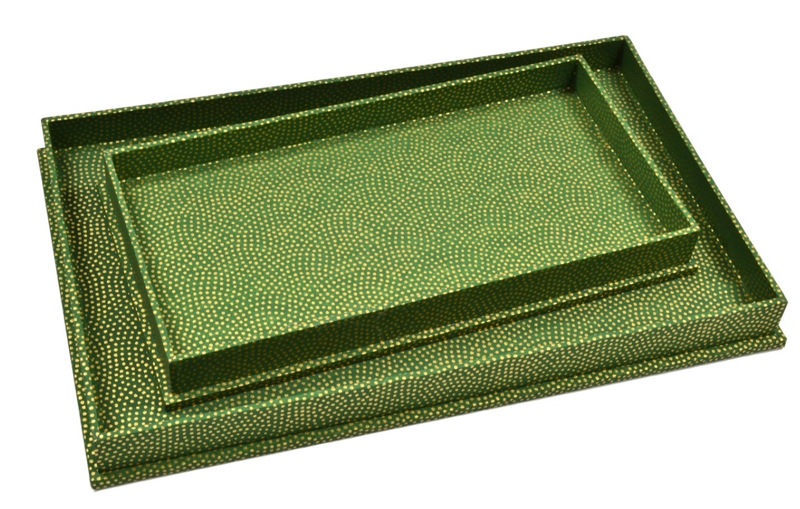 Catch-all trays in two sizes are perfect for your desk and for your vanity as well. They can be made flat like the two above or brass-footed like the pencil cups. 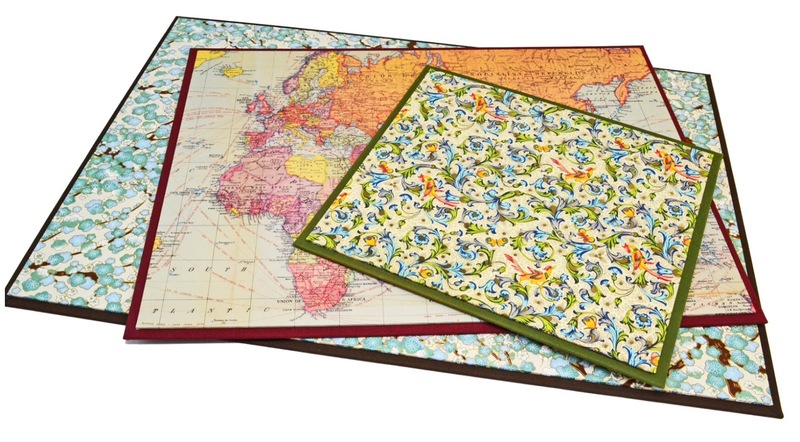 I just love their desk pads. Keep them with the design facing up when not in use, and flip over for a traditional blotter side when you are ready to work. Additional blotters can be ordered. Here are those great brass feet again, this time adorning a letter holder that has a super handy tray in front so you can store a letter opener, pen or pencil and some stamps and paper clips. Legal pad holders perk up a mundane task like taking notes at a board meeting. 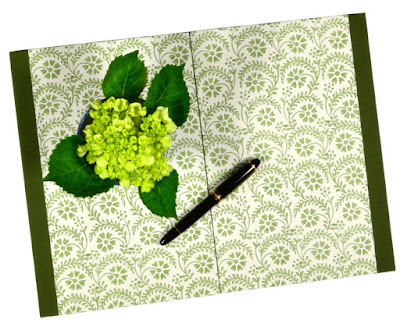 This size holds a standard legal pad and has a side pocket for loose papers. 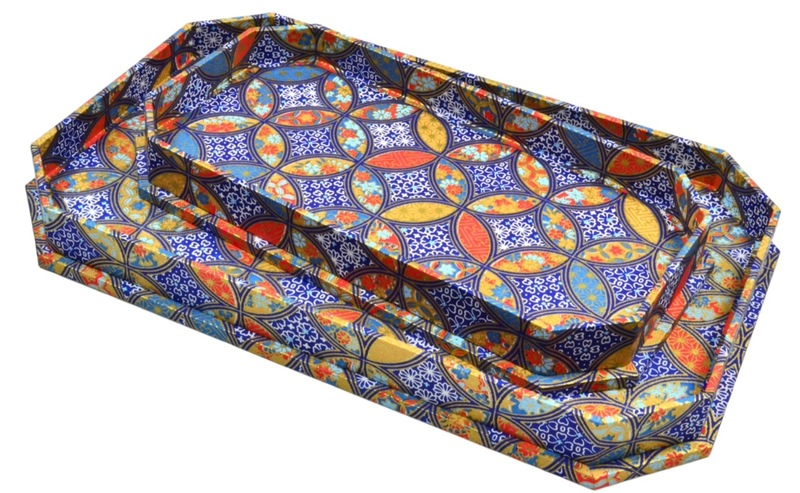 Smaller sizes can be ordered to leave in your guest rooms. You can stuff the pocket with brochures for local points of interest that your guests may be interested in visiting during their stay. 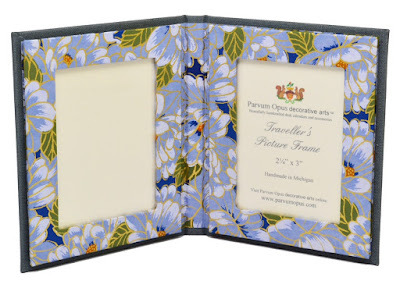 Double frames are hard to find, but Parvum Opus makes a really lovely one. Choose from any of their papers (one for the front and one for the back) or send them a paper of your own to use that will perfectly coordinate with your room. 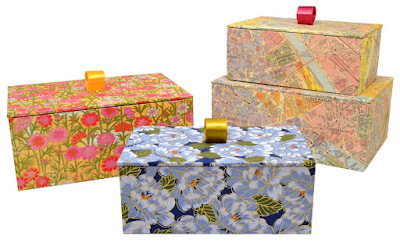 Storage boxes for anything your heart desires come in various sizes. 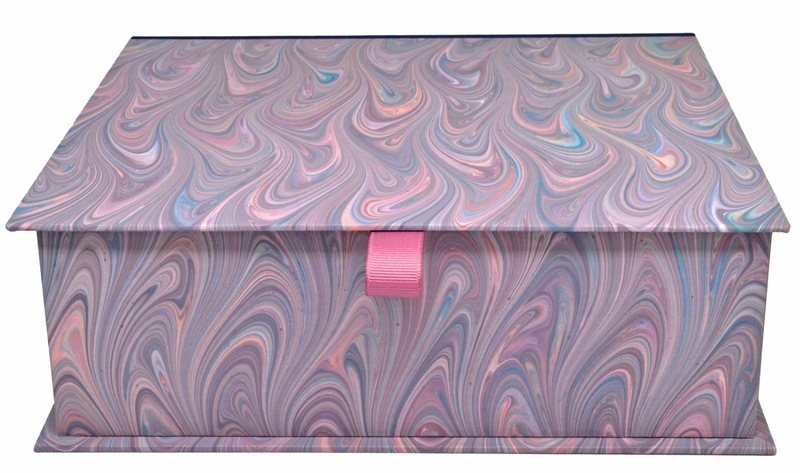 They can hold prized trinkets, tape and clips, makeup or receipts, for example. 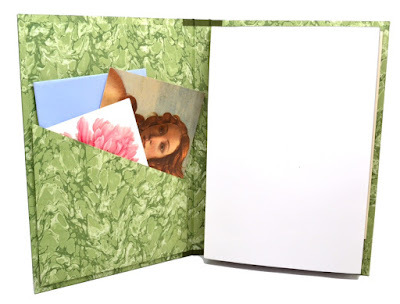 We found that the larger size is perfect to store your greeting card collection. Make some dividers and store your collected cards under headings like BIRTHDAY, BELATED, GET WELL etc. 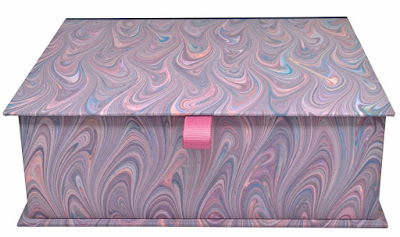 You will always know right where your cards are and in the meantime, the box looks pretty on your desk. 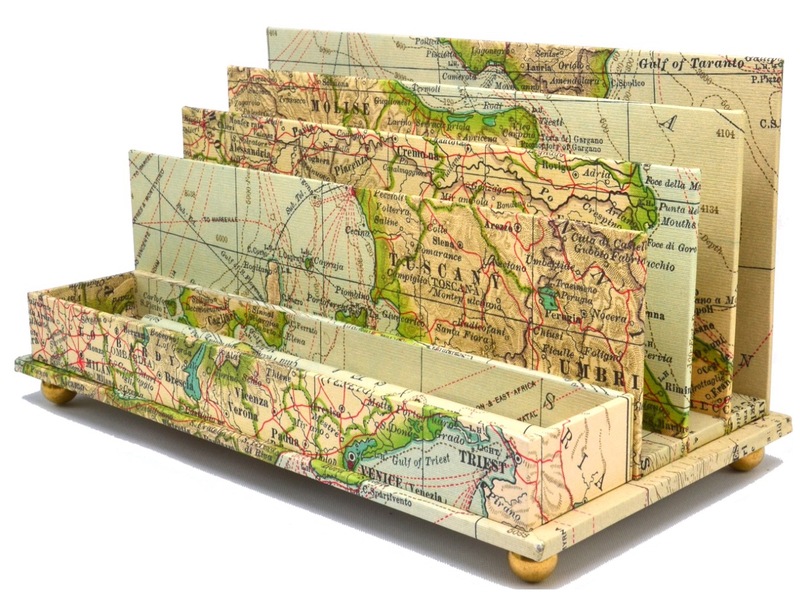 A new style letter holder caught our eye. 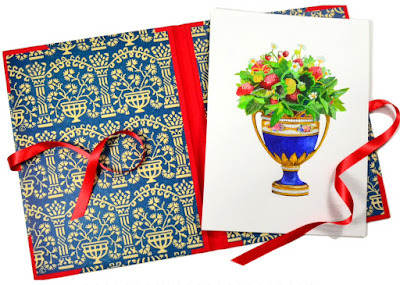 We thought this topiary-inspired box looked great! 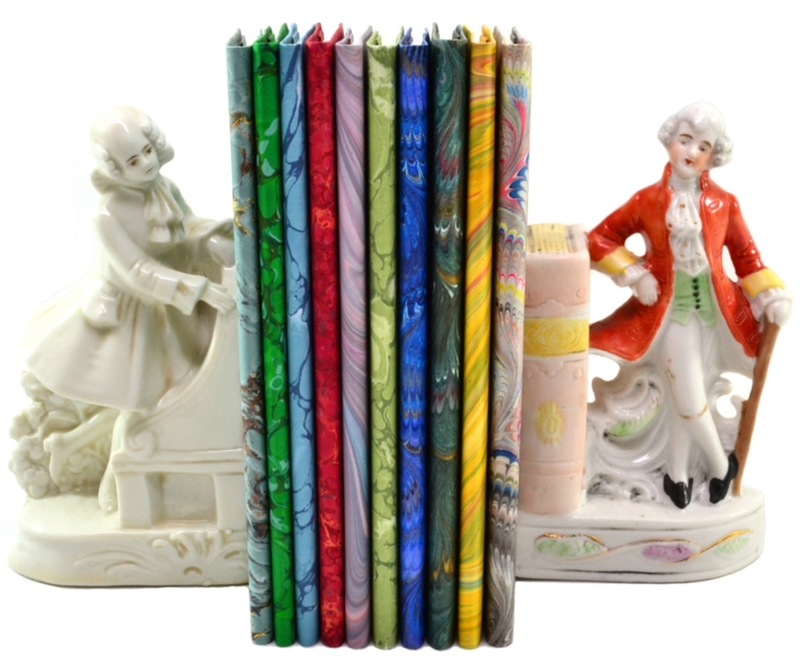 The owner, Erika, will even make you short or long pencils covered in coordinating papers to go with it. 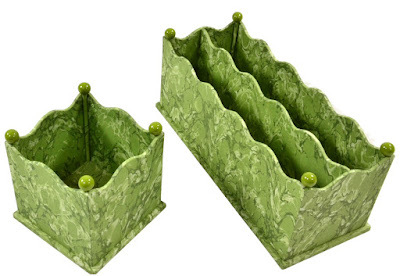 Personally, I would use this holder for all my paper items and order a matching square pencil cup for the matching pencils. 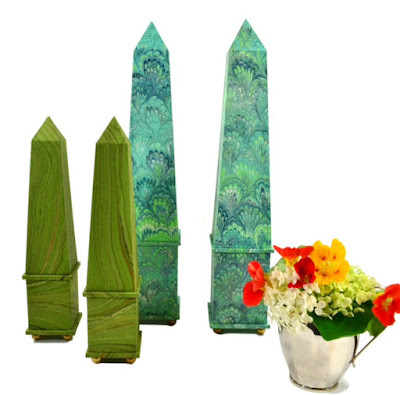 Obelisks have been traditional desk accessories forever. On a desk, in a bookshelf or flanking a great piece of porcelain on your mantle, a pair (or two) of obelisks would be très magnifique ! The wavy edge design is brand new. 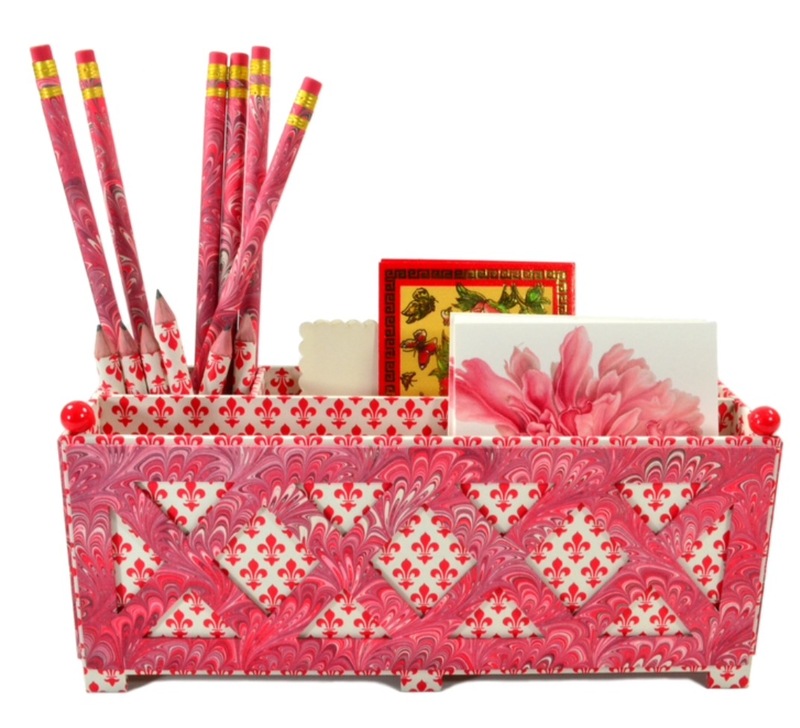 Everyone at the Boutique loves anything with a wavy edge (towels, bedlinens, notecards and now desk accessories). There is even a wastepaper basket that is part of this collection. 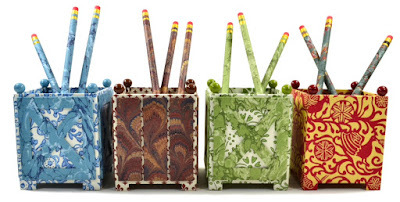 These are the little pencil holders I was telling you about. While they are adorable on their own, don't you think they would be a perfect companion to the topiary letter holder? Another shape tray for your desk or counter-top is pictured above. 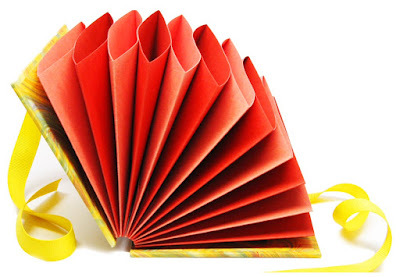 Flat or ball-footed, they are decorative but oh, so functional. Parvum's six-sided boxes have a ceramic-relief knob on top. It reminds you of a cameo and adds just the right "Italianesque" touch to these little gems. 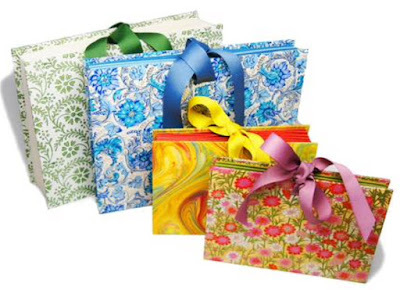 Great for paper clips, stamps, push pins, rubber bands as well as a million other little treasures. 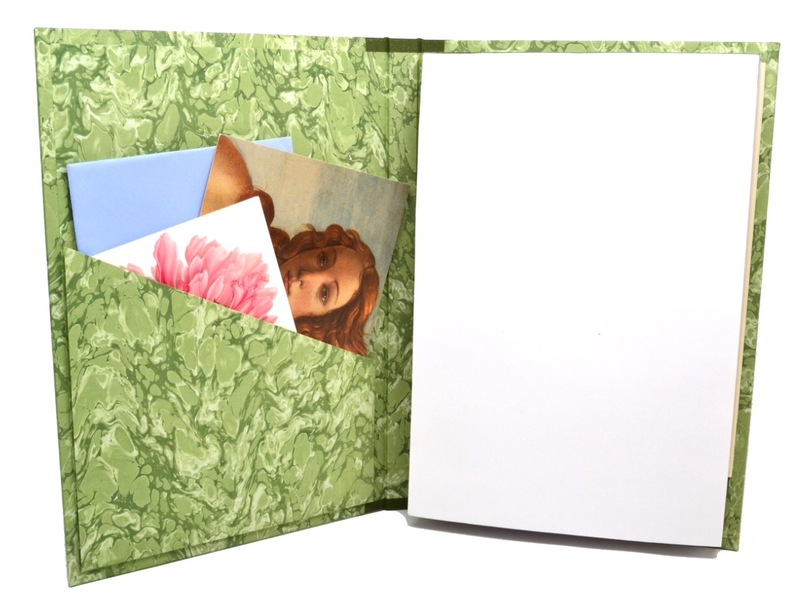 The portfolio is a great way to store and present your work. 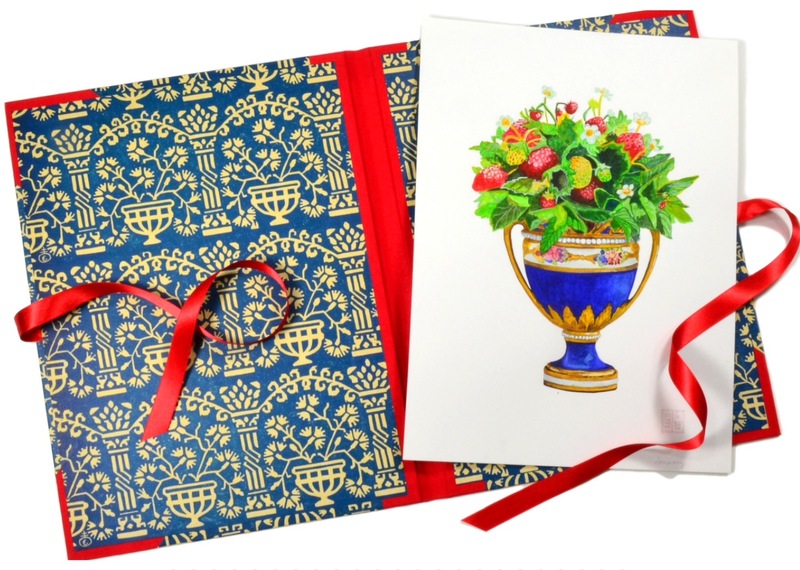 It is so much prettier to pull your artwork from a linen-bound, Italian-paper covered folio than from an ugly black leatherette zippered case......a much more impressive presentation. We all have found a lot of uses for accordian files, from receipt keeping to coupon storing. Take a few extra minutes and label the sections to make your life easier. Another variation of a desk blotter has sides that close. The advantage is that you can use it as a portable writing surface. Now here's the fun part .... you may choose from any of these 27 wonderful Italian and French papers to cover your bespoke desk accessories and books. Erika is constantly adding designs to the mix so there is always something new. We have an order on its way from Parvum Opus and I'll be sure to notify you when it is here. 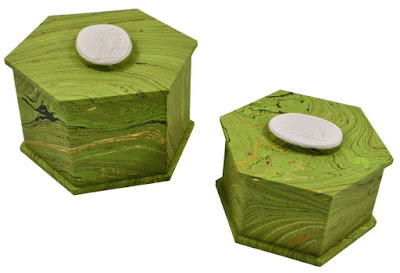 Until then, why don't you design a desk set for yourself and let her create it for you. Call me with your requests and I'll have your vision put into a working order. This company loves new ideas and challenges, so if there is something you don't see and you absolutely need, just let me know. Please call or email for prices on any of the above items.